The original fit jean for cowboys in training and the official ProRodeo Competition Jean from Wrangler - just for boys The Cowboy Cut jean was built to the detailed specifications of top rodeo athletes with features designed for riding - but great for every cowboy - including heavyweight denims, rivets on all pockets, strong double stitched outseams, and higher positioned back pockets. Cowboy Cut Wrangler jeans feature a handsome prewashed tan denim wash. Traditional five-pocket construction. Rise comfortably sits at waist. 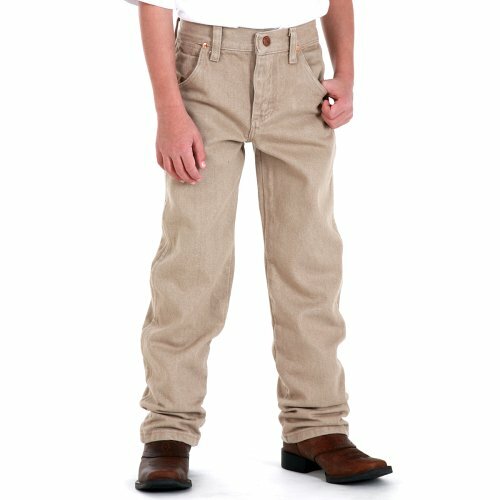 An adjustable waist with hidden elastic tabs allows these Wrangler jeans to grow with your young cowboy. "W" stitching on back pockets. Wrangler logo patch on right hip pocket. Imported.